A New Year’s Eve television special. 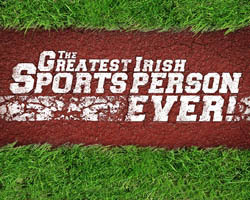 The programme counted down the TOP 10 Irish Sportspeople, as voted by the Irish public and featured interviews with many of the nominated sportspeople along with their family, friends and coaches as well as a prestigious line up of sports commentators and journalists. Presented by Aidan Power, the programme also featured classic archive images of the Top 10 sportspeople and the most memorable moments of their careers. Broadcast on RTÉ One – New Years Eve, 2009.